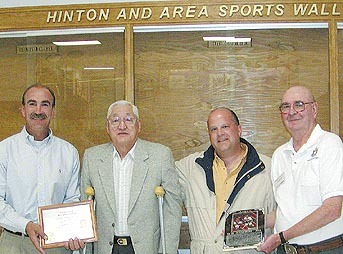 Hockey legend Bob Nystrom returned to his hometown Sept. 1, 2001 to be honored with a plaque that will make up part of Hinton's new Sports Wall of Fame. 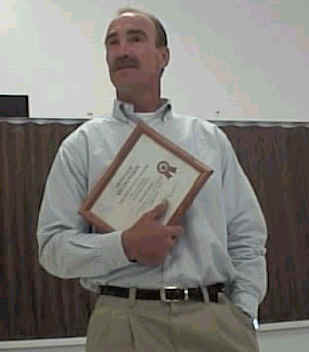 Nystrom was presented with a plaque that will remain in the Wall of Fame as well as a certificate for him to take home. Making the presentation were Tets Kitaguchi, brother of Nystrom's minor hockey coach, Ewen Murray and John Mitchell. The award commemorates his rise from Hinton minor hockey to a 14-year career with the New York Islanders. Nystrom is best-known for his overtime goal in 1980 that brought the Islanders to victory over the Philadelphia Flyers, and gave them their first of four consecutive Stanley Cups. He played as a right winger for many years, finishing his NHL career with 900 regular-season games played, 235 goals, 278 assists, 513 points and 1,248 penalty minutes. Nystrom played 157 playoff games, scoring 39 goals, 44 assists, 83 points and 236 penalty minutes. He currently works as an executive vice-president of HRH, one of the largest property casualty insurance firms in the United States. He still remains a favorite of New York Islanders fans. Nystrom makes his home in Long Island, N.Y. with his family. His son Eric is signed up to play hockey for the University of Michigan Wolverines this fall season. 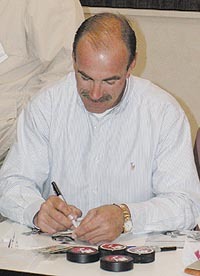 Bob Nystrom signs pictures and pucks for Hinton youth. Family and friends gather to celebrate Bob's induction to Hinton Wall of Fame.